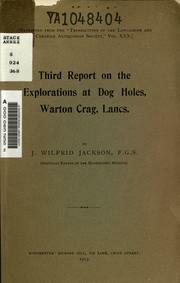 1 edition of Third report on the exploration at Dog Holes, Warton Crag, L... found in the catalog. Add another edition? Are you sure you want to remove Third report on the exploration at Dog Holes, Warton Crag, Lancs from your list? Published 1913 by R. Gill in Manchester .